The Sinn 856 has become a gold standard for an attractive, highly legible and uncluttered watch in a bulletproof case (fully Tegimented). The case size is a perfect 40 mm which provides an ideal fit for the majority of wrist sizes. Sapphire crystal with luminous hands and hour markers. Watch is water resistant to 20 ATM. Black Sinn calf leather strap with tang buckle. "The 856 Is A Keeper"
Verified Owner Comments: From the structural integrity of the case and the Tegimented treatment, to the easy to read dial, it’s a pleasure to wear such an understated watch. My son thought so as well hence, the Sinn 856 I bought from WatchBuys almost three years ago is now on permanent loan to him. I had no choice, so I bought another Sinn 856 for myself! Verified Owner Comments: I have been wearing my Sinn 856 for about a month. It sits well on the wrist for every day use. I was interested in it's anti-magnetic label (80,000 A/m or 1000 Gauss or 0.1Tesla) without knowing what that really means because I do work around MRIs (0.5-1.5 Tesla). I have worn several watches around MRIs such as Apple series 2, Bulova 267 Hz, and Zodiac Orange Dive. I know that if I get too close, the watch would stop but they have so far restarted as I move away from the MRIs. What was unexpected about the Sinn 856, was that the pull on the case near the MRI was very strong. I did not expect the steel case for an anti-magnetic watch to be that ferric. I realize that anti-magnetic usually means the mechanism is protected somehow (like in a Faraday cage) but why would the case made to be so ferric? "Sinn 856 on leather strap"
Verified Owner Comments: I was considering both the Sinn 856 UTC and the 856. I ultimately went with the 856 because for me the UTC dial was a little cluttered with the 24-hour scale and the second time-zone hand was hard to read and not lumed. The 856 has a beautiful uncluttered highly legible dial that for me made the difference. Both share the very well finished case from SUG with the Tegimented technology and drilled lugs which for me is great because I usually remove the OEM strap and stress about scratching the case. Dehumidifying technology and anti-magnetic properties and nice size watch that I feel you can wear under a dress shirt or on a hike. This was my second purchase from Watchbuys and as with the first the customer service before and after was outstanding and I would recommend them. Verified Owner Comments: I own a Dornbleuth and a Nomos but this is my favorite. Like someone else mentioned, I can wear this watch anytime without worrying whether I’m going to damage it. Surprisingly, the leather strap can resist almost anything including water but I wouldn’t submerge it. The deployment clasp is a must and one of my favorite features of the watch but an option for an added price. "great watch, great buying experience"
Verified Owner Comments: This is a very readable and attractive dial. I wanted a sturdy, scratch resistant watch with great legibility. I wanted to be able to quickly and precisely observe the minutes hand and markers. This pilots watch exceeds most of my expectations. So far accuracy is acceptable, at +8 seconds per day. It may settle down some in the coming months. Matt was very communicative and helpful throughout the buying process. In large part because of him, I will use Watchbuys in the future. Verified Owner Comments: Great design , easy to read dial and keeping good time...+ 2-3 seconds a day. I like the Technology that Sinn builds into the watch.. So far the tegimented case appears bulletproof... I have found the strap too stiff..Within The first few days , the inside leather keeper developed a small tear from simply putting the watch on..I fixed it with a small piece of electrical tape and it appears fine.. I would buy the 856 again and recommend it to people...I bought a 656L from WatchBuys about five years ago and enjoyed it too. For my money, Sinn represents great value. Verified Owner Comments: My first Sinn and couldn't be happier. Perfect size and heft- I have average wrists and it sits perfectly. Not too ostentatious and not too small. I originally tried the 556a and found it to be slightly small (though my wife liked it and it would have looked great on her). The dial couldn't be more classic or easy to read. I was worried I wouldn't like the titanium-esque color of the case. No worries now. It matches the face elegantly. WatchBuys experience was fantastic. Great communication and easy shipping. Only downside was that I wished I could have used the FedEx option to reroute the package to a specific site because I knew I wouldn't be home. I guess you have to be a repeat customer for that option. All the more reason to get another watch! Verified Owner Comments: I have several different watches from other European watch makers and the Sinn 856 is my day to day go to watch. Simple, classic styling, nice movement, sturdy and easy to read. I have worn it to the office, hiking, on industrial construction sites and it fits every occasion. My father in law swayed me from Swiss brands to this German brand and I couldn't be happier. The watch was shipped on time and it arrived as I expected. This will not be my last purchase from Watchbuys. "A great watch that's a great value"
Verified Owner Comments: I own a really nice Rolex but I wanted a watch that I don't feel the urge to take off if I'm about to do something that might beat it up. After a lot of online research, I settled on a Sinn 856. I couldn't be happier with the watch or the service that I got from the supplier, WatchBuys. I like it better than the Breitling Super Ocean and the Omega titanium SeaMaster that I previously owned - and the Sinn costs a lot less. Frankly, I like it better than my Rolex which looks really over-priced in comparison to the Sinn. Don't be misled by the fact that Sinn doesn't advertize much in the U.S. They're the real deal. Verified Owner Comments: The watch is 40mm not 37.5 like the 556a, a must for my 8" wrist. Does not have the UTC, so easier to read dial, hard case, humidity warning. I can not stress enough, you to make time to go to the Road show. See them up close, put them on. The 556 would have been a mistake. I had notebook pages of questions Matt and the others answered-bezel mating, modification to movement hardness. I was able to get all my questions answered and am very very happy with this watch. High quality leather strap Just an overall beautiful watch Cons: Don't like the copper sulphate capsule, would prefer not to have a hole in the side of my watch Not a fan of the sideways date. Verified Owner Comments: The watch was delivered right on time as promised. It matches up with the description perfectly and is absolutely perfect. The look and feel of the watch are just what I was looking for and the price was very fair considering that other similarly styled watches sold through retailers cost more than twice as much. Watch Buys made the process so simple and their personal contact with me was really a nice touch. Since it is an on-line purchase they contacted me directly and talked me though what would transpire once the order was processed. 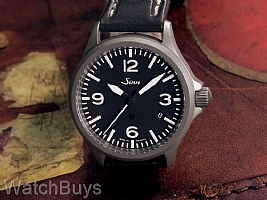 I would buy another Sinn watch through WatchBuys once my Watch Fund fills up again. I think the Sinn product is one of the best out there. Verified Owner Comments: The 656 was nearly my perfect watch, but I always desired a slightly larger, tegimented case. It took Sinn some time (+10 years), but they finally came through. They added the inert gas and copper sulfate technologies as well as "upgraded" the movement to an ETA 2892. It appears to be gaining 7-8 seconds per day, but may settle in as it is still new. Perfect watch for me, but just as important was the excellent service provided by Matt and Rob. This was my first purchase from Watchbuys, but it will certainly not be my last! Verified Owner Comments: This watch did not disappoint. Understated, tough, functional, 2892 movement. Just a beautiful timepiece that will last, and last. Verified Owner Comments: A fantastic watch. I wear it daily on a Sinn silicone strap and it is perfect. Understated,comfortable, functional and bombproof. In my opinion, excellent value.